Teaching guide and information by Carla Mulford at the Heath Anthology site. Information on Sewall's anti-slavery tract The Selling of Joseph from the PBS site. The Salem Witch Trials site by Douglas Lindner has information about Sewall. 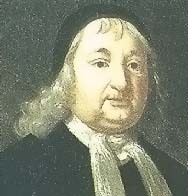 Portrait of Samuel Sewall courtesy of Douglas Lindner's site on the Salem Witch Trials. The Selling of Joseph (1700) from the PBS site on Africans in America. Sewall kept a diary from 1673-1729 with a gap between 1677 and 1685. In 1878-82, the diary was published in three volumes by the Massachusetts Historial Society.